You can still enjoy Globe Gosurf 99 if you want an internet promo with 30 days validity. Enjoy posting on Facebook with your 200MB of data when you subscribe this via Globe’s rewards catalog. You need at least 20 rewards points for you to avail this promo, unlike before where you need 99 pesos regular load balance to register. You can earn points every time you reload your account or you can ask your friends, brother and your parents to share their Globe rewards points with you. 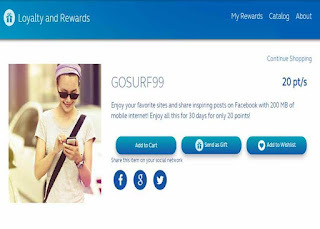 If you they have extra points, just follow How to Share Globe rewards to another mobile number. As long as you have enough points you can easily register to this promo. If you don’t have enough points you can look for a legit Globe discounted promo seller, beware of scammers. Here’s a sample message after you redeem Globe Gosurf 99 promo. “You've successfully redeemed a reward item from Globe Rewards! We hope you like your reward as much as we take delight in extending it to you. Thank you for being with Globe! You need 20 rewards points on your mobile prepaid account. For other offers check out the List of Globe GOSURF promo packages. You can check your remaining balance by texting GSURF (space) BAL to 8080. If you want to stop redeem rewards, you may try calling Globe hotline by dialling 211 to request for assistance. For the last week of March, Globe will not allow you to redeem Gosurf99 or transfer points or do anything else with points (service temporary unavailable). Presumably you will be able to transfer points after March when Globe has stolen them all.